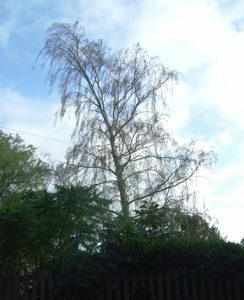 The birch tree, sometimes known as a “pioneer species”. It is one of the first species to colonize areas of undisturbed land. It is fast growing and loves sunlight, tolerant of cold weather and harsh climates. However, like the one in the photo they are quick to turn up their toes. I visited this tree in November 2015 regarding concerns about the lean of the tree. I was not too concerned as the tree seemed quite healthy. However, having driven passed a few times lately and have noticed a very quick deterioration. Due to the wet spring I have noticed that birches have some leaf fungal issues. Some have partially defoliated early and will hopefully recover again next year. However, this tree looks to be in terminal decline because of the brown shriveled leaves. It was noted that there was a privet shrub (a favourite of honey fungus) that was dead within 10 metres of the tree so I have deduced that honey fungus is the culprit. The tree sits within a Conservation Area and I have notified the Council of our intention to remove it. It will be interesting when we do so to see whether there is any evidence of rhizomorphs (bootlaces, black fungal threads) beneath the bark and if this is not evident there may be a mushroomy smell under the bark and mycelial fans (thick white felty fans of mycelium) or even some brown clumps of fungal fruiting bodies evident around the lawn area. You can find more information about Honey Fungus and a list of immune or resistant tree species and shrubs from the RHS Website. There were no objections to my notification for undertaking this work in the Conservation Area. During our works on site I did not notice any fungal fruiting bodies on the lawn or in the general area, however, sometimes they are hidden away on root runs or mown off by the gardener/client. These may have rotted away as we have now had a frost. Although I did not look too hard as time was not on my side, I saw no rhizomorphs (boot laces) around the stem or under the bark. There was a lot of die back on the extremities of the branches although we could see green by scratching the bark further down the stem. 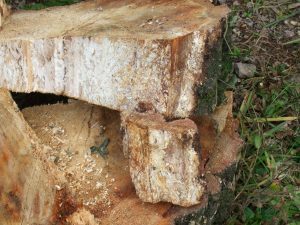 Decay had already started and the white felty fans of mycelium can clearly be seen under the bark and along the fracture. My feeling is that we caught the tree in time before it had time to blow over and cause any damage to its surroundings. 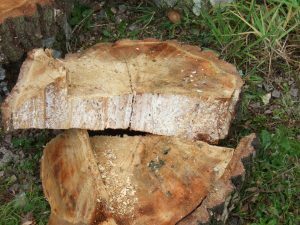 Birch trees have a poor defense mechanism, consisting mostly of ripe wood with no defined heart wood containing tannin. This can help suppress decay therefore decomposition starts very quickly. I don’t think this tree would have flushed in the spring. Honey Fungus is naturally present in woodland situations, however any dead trees may not be noticed or missed. However there is natural suppression within a woodland eco-system by other beneficial decay fungi. Unfortunately in most garden situations the plants and trees are very precious. When one is sick it can be very noticeable and leave a sudden gap in the planting scheme. Part of the problem is that our gardens are too sterile as we clear up all our dead wood, twigs etc. which may provide a home for beneficial fungi. Sometimes certain chemicals applied as lawn treatments may also affect microbial and fungal activity including the good fungi i.e. mycorrhizal. Next → Next post: Dynamite and Trees – is this the way Forward?